I love Sundays. The waking-up-lazily-at-11, the excuse to skip straight to lunch, the afternoon nap and, of course, the intensive Sunday dinner. The last few weeks, it seems as though I cannot be happy unless I’m sweating over a hot stove, etc. Also, my dear friend Katie was coming over to write an article about me for her food writing class, so I had to simultaneously feed and impress her very selective vegetarian palate. Homemade ravioli fit the bill as sufficiently labor intensive and, ultimately, delicious. I’ve adapted this recipe to include ricotta cheese in the filling. It’s just not ravioli without ricotta cheese, in my opinion. Actually, it’s just not a meal without cheese, period. 1) Preheat the oven to 400 degrees. Place butternut squash on a pan with a lip and drizzle with olive oil. Cook for 20 minutes, flip, then cook for another 20 minutes, or until tender. 2) Meanwhile, mix all pasta dough ingredients in a bowl. Knead for several minutes on a well-floured surface, adding more water as needed. The dough should be smooth and elastic. Wrap the dough ball with plastic and let sit for 30 minutes. 3) Once butternut squash is tender, scoop out the flesh and stir in nutmeg, cinnamon, brown sugar, salt and pepper. Let cool to room temperature (or place in the refrigerator), then add ricotta. 5) Cut flattened pasta dough into 2 by 2-inch squares. 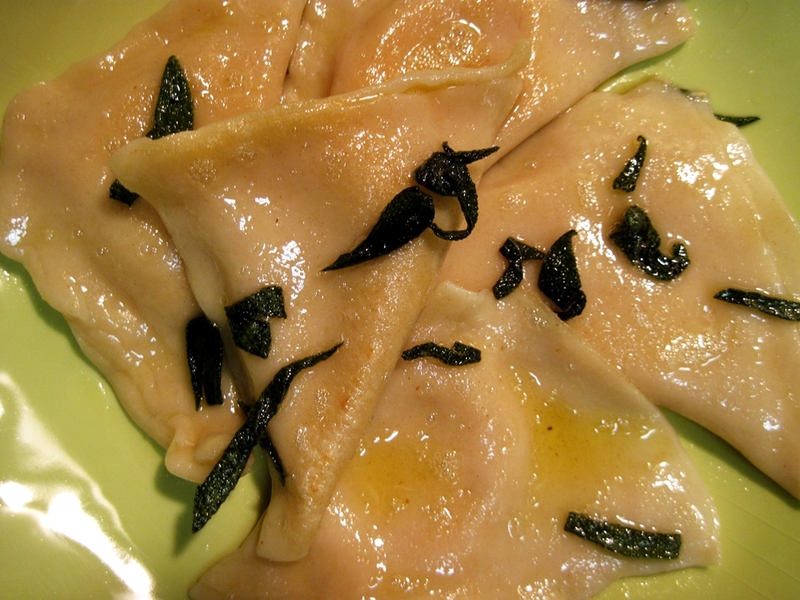 Place a teaspoon of filling in the center of the square, then fold pasta over to form a triangle. 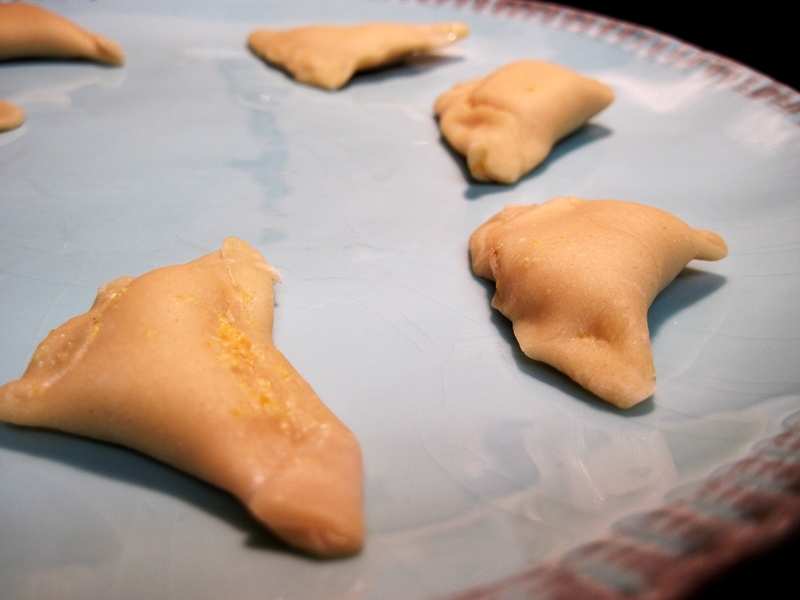 Seal the dough around the edges with your fingers. Have a bowl of water nearby to moisten your fingers as the dough dries out. 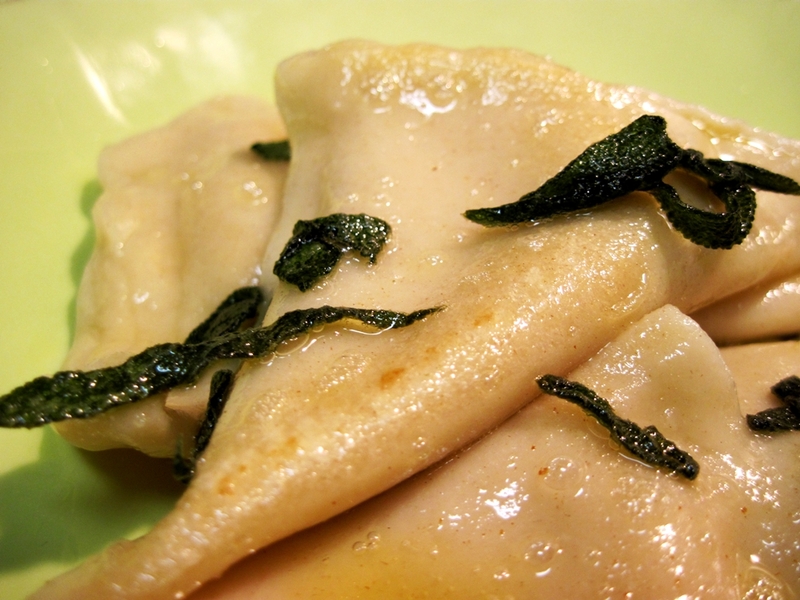 Set uncooked ravioli aside. Repeat process with other dough ball. 6) Boil a pot of water while preparing the butter sage sauce. To make the sauce, melt butter in a large skillet over medium heat, then add sage. Add ravioli to pot of boiling water and cook for about 5 minutes, or until soft. 7) Drain ravioli and add to the skillet. 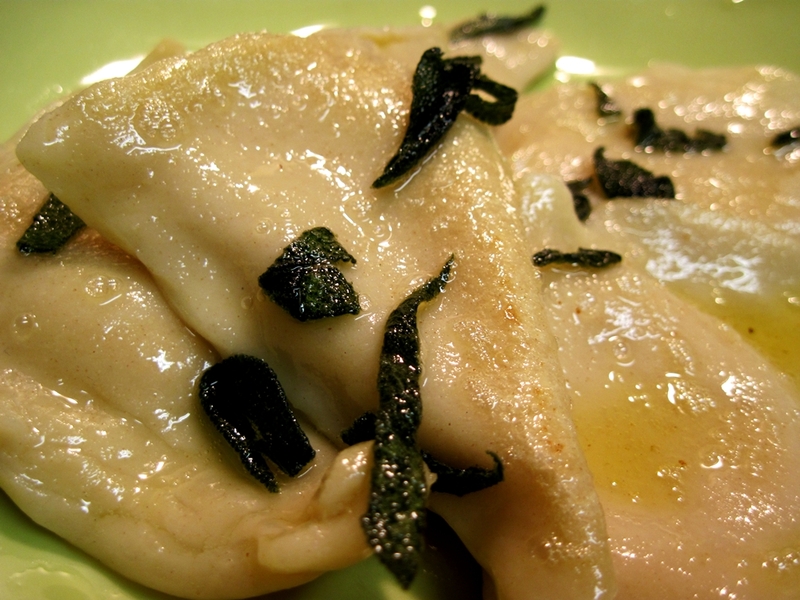 Coat the ravioli with butter, place on a plate, then sprinkle with Parmesan cheese. It’s beautiful!! Flavors sound so yummy, too! It’s such a nice fall recipe. As I grow butternut squash in the back yard, they can get much bigger then the store bought models. slice into 1 inch rings. slice of outer skin from rings. nuke until soft (3 to five minutes per bag). Processing this way the whole squash is done in 20 minutes for those small store bought, without the hot oven, competing with my air condtioner (important when you live in a desert). Thanks for the tip, Steven! My oven is so leaky–microwaving the squash would help me immensely, too. I assume you live out west somewhere? High Desert of California. 120 in the summer is common. It’s quite surprising how well butternut grows. And I forget a good cutting technique. I ‘saw’ the butternut squash. Since it rolls well, I shapen a big knife. Place it on the side of the butternut and roll and press down. Slides right through, fast and without a chance of cutting off a finger. The ravioli look scrumptious! And I absolutely agree with you, both on the joys of lazy Sundays and the importance of cheese at every meal.